Imagine you have to navigate your way through the nighttime ocean while hunting for food and avoiding predators. Now, imagine doing that while moving at 20 mph. Dolphins perform feats like this daily, utilizing not just vision but adaptations such as echolocation to find their prey. 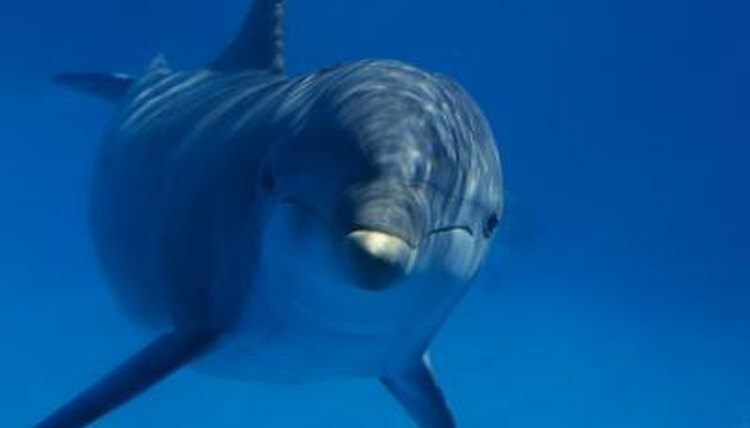 A dolphin uses echolocation by creating clicking sound waves in its nasal passageway that travel through the top of its head, or melon, in a specific direction. The waves bounce off of an object or objects and are received by the dolphin. Rather than using an external ear like you, dolphins pick up the waves via their lower jaw. Their inner ears operate independently of each other, providing for better localization. Dolphins are able to use echolocation to find their favorite foods. It takes time to learn, but they can identify a 6-inch fish 600 feet away. Could you do that? Based on how they receive the waves, dolphins can interpret information such as the shape of the object and where it is moving. Like an x-ray beam, dolphins use echolocation to “see through” objects like the sandy ocean floor. This allows dolphins to find prey in hiding. Dolphins are able to see better in the water than people. Their corneas and lenses allow for accurate vision both in water and out. Dolphins have rods and cones in their retinas, which allow for vision in dim and bright light. Much like a cat’s eyes, which can reflect light at night, a dolphin's eyes have enlarged tapetums, which reflect light back to the retina. While dolphins use echolocation, a dolphin with the ability to see is more successful than one that cannot. You may not be able to move your eyes independently of each other, but dolphins can. Their eyes are on the sides of their heads, rather than in front, so they can see in virtually all directions. Dolphins have a large brain, although scientists are not sure why. Increased size for auditory capability is the likely culprit. While the intelligence of animals cannot be classified, dolphins have shown an incredible propensity to learn. Many dolphins have iron oxide crystals around their heads. Scientists hypothesize that this allows them to navigate by using the magnetic fields around the globe. The Dolphin Institute: How Dolphins Perceive Their World.